It can be hard to get a room full of people to agree on a single subject, but we think that almost everyone can agree that it’s not a pleasant feeling to have sensitive teeth. You know how the dessert menu intrigues you with mouthwatering pictures thick milkshakes and malts? But then you remember that you won’t be able to enjoy those sweet treats because your mouth will be in pain. If you’re experiencing tooth sensitivity, it’s time to get assistance from your Virginia Beach dentist at Smile by Design. 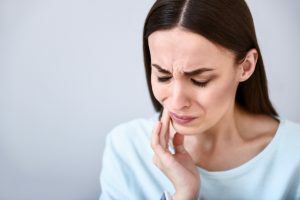 There are at least a dozen causes of tooth sensitivity, but the most important thing to note is this: the inside of your tooth is dangerously exposed to foreign materials, dental bacteria, and food particles. The layers of our teeth consist of enamel (outermost protective layer), dentin (majority of our teeth), and the pulp (inside roots and nerve endings of our teeth). The point of your enamel is to protect the inner, more sensitive layers of your teeth, but when that becomes ineffective because of tooth decay or some other trauma, your teeth become very sensitive to hot, cold, or sweet substances. Whitening or bleaching gels can cause sensitivity for a little while after a treatment—but don’t be alarmed if you got your teeth whitened in our office, that’s just our strong bleaching agent reaching the inner layers of your teeth to remove stains. Receding gums expose the dentin of your teeth on top and can be very painful. Brushing too hard can scrape away the enamel on your teeth, causing tooth sensitivity. Acidic foods like citrus can burn down the enamel of your teeth. Trauma like habitually chewing ice or grinding your teeth can cause cracks in your enamel and crowns of your teeth, exposing the inner workings of your very sensitive tooth. Enough problems—what can Smile by Design do to help me? If your teeth are sensitive from minor tooth decay, our dentists will probably offer to clean and fill the affected area with a tooth colored filling. If your prior filling was lost or came loose, our dentists can replace it. Use toothpaste that is specifically for sensitive teeth (like Sensodyne) and enriched with fluoride. Don’t chew tobacco because it will quickly destroy enamel and catalyzes gum recession. Wear a custom mouthguard when you sleep to avoid teeth grinding and causing unnecessary wear and tear on your teeth. We can’t say it enough! Prevention is critical! Contact your family dentist in Virginia Beach to schedule your next appointment.